Photovoltaic Panels or PV for short comprise a number of light sensitive silicon cells connected together. These solar cells have no moving parts and produce electricity when exposed to solar radiation, i.e. sunlight. PV panels produce DC electricity and are frequently used to charge batteries, in order to power DC appliances. Multiple panels can also be linked together and their output fed through a grid tie inverter to produce grid synchronised AC. This can be fed directly into the ring main of a building. PV systems are characterised by being easy to install and easy to expand if more power is required. Contrary to popular belief the panels do not require bright sunlight to operate and will produce useful output even in dull overcast weather. However more sun is preferable and the yield from panels will vary with the changing seasons. Also outputs increase markedly when they are installed at sites nearer the equator. Cruising yachtsmen often notice this improvement in performance as they sail southwards to the Mediterranean and beyond. Eclectic frequently recommend that PV panels are installed together with small wind turbines. These technologies complement each other and together produce more balanced generation, across the year. The wind turbine is typically more productive during the winter when the short days and low sun limits PV output. The reverse is true during the summer. 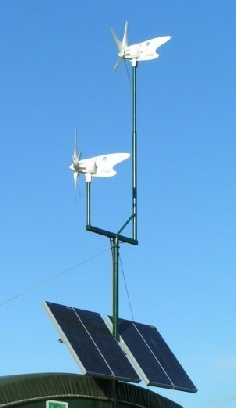 For battery based systems both wind turbines and PV can simply be connected in parallel to the same battery bank, via a charge regulator to prevent battery damage through overcharging. It is important that PV panels are securely mounted in a location where they are fully exposed to the sun and not overshadowed by trees or other obstruction. The best yields are obtained where the panels are maintained perpendicular to the sun at all times and various powered tracking devices are available which will do this. However, most installations are fixed, and assuming they are correctly orientated will work well. PV Panels are available in various qualities with mono-crystalline units offering superior performance to the polycrystalline type. In the UK typical annual yield for PV is around 100 kW hour per square meter. Eclectic do not routinely stock PV panels, but we can specify hybrid wind/ solar systems and will supply panels where clients are requiring a single source of supply.